Fall asleep faster and stay in deep sleep longer. The only mattress designed to adjust to your body temperature and provide the support essential to restorative sleep is here. Incredible Comfort: Experience the pressure relief of memory foam and support of a dynamic coil system. Sleep Cool: Temperature regulating technology invented by NASA puts you to sleep in real time. Incomparable Quality: Hypoallergenic & toxin-free, designed in our innovation lab and handmade in the USA. Medium Soft: Perfect for side sleepers and back sleepers. Extra pressure relief for relaxed comfort. Medium Firm: Our most popular, considered the "perfect" feel. Great for all sleepers. Strong support. Our Hybrid mattress combines the pressure relief of memory foam with the superior support of our individually pocketed coil system. Tomorrow is engineered with the sleep research and manufacturing expertise of Serta Simmons Bedding. So, rest easy – 1/3 of your life is in the hands of real experts. 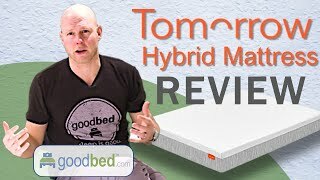 To decide whether Tomorrow Sleep is the right choice for you, read GoodBed's expert review of the Tomorrow Sleep mattress or watch our in-depth video review of the Tomorrow Sleep mattress. Is Tomorrow the right bed for you? Tomorrow mattresses are recommended by 56% of owners on GoodBed (based on 50 ratings + 2 reviews). Do you have something to say about your Tomorrow mattress? Write a Review! Note: The product line specifications above were derived from the active Tomorrow models listed on GoodBed. As a result, these details may not be comprehensive and may not apply to all Tomorrow models. If you are seeking specifications for a particular Tomorrow mattress, please search for that mattress by name on GoodBed, or check with your local Tomorrow dealer. Tomorrow is a mattress manufacturer founded in 2017 that is based in New York, NY in the United States. Additional product details can be found by viewing discontinued mattress models from Tomorrow. Have an update or correction to our information about Tomorrow? If so, please take a moment to suggest an edit.